NOTICE: Activation key must be used on a valid Steam account. 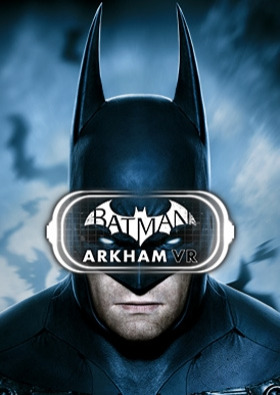 Requires internet connection.This game requires a virtual reality headset HTC Vive or Oculus Rift.About the game Batman™: Arkham VR immerses you in the Dark Knight's Universe and redefines what it means to be the Batman. Key Features Experience Gotham City through the eyes of the World's Greatest Detecti… ve in an all new Arkham mystery. Think like Batman. Utilize his legendary gadgets in Virtual Reality to unravel a plot that threatens the lives of Batman's closest allies. System Requirements Windows - Minimum OS: 64-bit Windows™ 7 SP1, Windows™ 8.1 or later, or Windows™ 10 Processor: Intel™ Core™ i5-4590 equivalent or greater Memory: 8 GB RAM Graphics: NVIDIA GeForce™ GTX 1060 / GTX 970 or AMD Radeon™ RX 480 DirectX: Version 11 Storage: 10 GB available space	BATMAN: ARKHAM VR software © 2017 Warner Bros. Entertainment Inc. Developed by Rocksteady Studios.BATMAN and all characters, their distinctive likenesses, and related elements are trademarks of DC Comics © 2017. All Rights Reserved.WB GAMES LOGO, WB SHIELD: ™ & © Warner Bros. Entertainment Inc.